Hamedan (Iran) – November 21, 2018 (travelindex.com) – The World Tourism Organization (UNWTO) International Seminar on Harnessing Cultural Tourism through Innovation and Technology and 40th Affiliate Members Plenary Session concluded with a renewed call for community participation in development of cultural tourism using cutting-edge technologies (12-14 November 2018, Hamedan, Islamic Republic of Iran). “Technology and innovation, including ICT, can improve the quality of the tourist experience. It can improve governance, profits and the wellbeing of residents. And it can preserve intangible and tangible heritage resources for the sustainable development of cultural tourism,” said UNWTO Secretary-General Zurab Pololikashvili opening the event. “The world’s diverse range of culture and heritage form the best means and ways to connect peoples of the world – but only if the rights and privileges of both host and guest populations are respected and responded to. And innovation and technology can help”, added Iranian Vice-President Ali Asghar Mounesan, who also heads the Iran Cultural Heritage, Handcraft and Tourism Organization (ICHTO). The seminar agreed that informed governance and policies surrounding uptake of new technologies and innovative practices can guide tourism development and open doors for the sector, with conservation and revitalization of cultural heritage one of its main benefits. It also highlighted that for tourism authorities, participation of, and collaboration with, the host community should be a driver for technology-driven change. It was urged that tourism development not only maximize benefits and minimize costs for greater competitiveness, but also respond to the expectations and needs of hosts and guests alike. The seminar was organized by UNWTO, ICHTO and Alisadr Tourism Company. 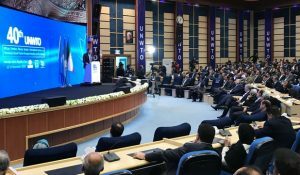 Alongside it, Hamedan played host to the UNWTO Affiliate Members’ 40th plenary, in which active discussions were held as UNWTO’s Affiliate Members voiced their opinions and suggestions on the Affiliate Members Department’s Programme of Work for 2019.